In this era of digital disruption, businesses must be more agile to capture opportunities. Many viewed cloud computing technology as the way to do this, promising to address agility, scalability, and cost. But in moving to the cloud, many found that its security, compliance, and performance did not fully meet their needs. Additionally, previous common thought was public cloud is less expensive than private cloud. We now know that is not true in all cases. Savvy businesses realize hybrid IT, which includes both offpremises and on-premises services, enables better agility. After initial experience with public cloud offerings, businesses learned that many workloads are best hosted onpremises, primarily due to security, compliance, performance, control, and cost issues. 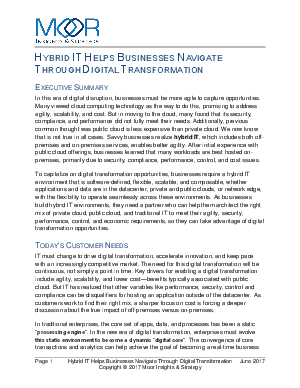 To capitalize on digital transformation opportunities, businesses require a hybrid IT environment that is software-defined, flexible, scalable, and composable, whether applications and data are in the datacenter, private and public clouds, or network edge, with the flexibility to operate seamlessly across these environments. As businesses build hybrid IT environments, they need a partner who can help them architect the right mix of private cloud, public cloud, and traditional IT to meet their agility, security, performance, control, and economic requirements, so they can take advantage of digital transformation opportunities.